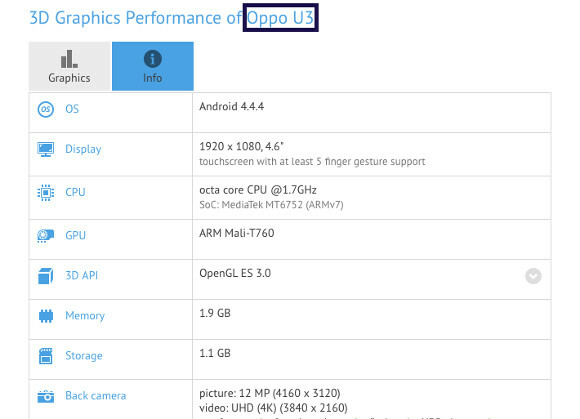 Oppo recently unveiled both the N3 and the R5, but it definitely looks like the Chinese company has another device to out before the end of this year (or soon, anyway). The yet unheard of Oppo U3 got itself benchmarked using GFXBench, and as usual that means we can take a look at some of its most important specs. The phone will apparently come with a 4.6-inch 1080p touchscreen, a 12 MP rear camera with 4K (UHD) video recording support, a 5 MP front snapper with 1080p video capture, Wi-Fi, Bluetooth, and GPS. It runs Android 4.4.4 KitKat. It will be powered by a MediaTek MT6752 SoC with a 1.7 GHz octa-core CPU, and an ARM Mali-T760 GPU, aided by 2GB of RAM. The odd thing is that the benchmark reports 1.1GB as the built-in storage space, which is incredibly low given the handset's other specs. GFXBench usually lists available space, and not the total storage, but this would mean the Oppo U3 could come with just 4GB. Hopefully this was a mistake, or maybe we're dealing with a very early prototype of the smartphone and the company didn't feel the need to fit it with more memory. This is all we have on the U3 for now, but do expect more details to come in the future - once the leaks start, there's usually no stopping them.